The proper definition of Ecotourism is: "Responsible travel to natural areas that conserves the environment and improves the well-being of local people." (TIES, 1990). We usually come across people saying they would like to observe different mammals in the rainforest at the same time, and sometimes some people have been disappointed with the fact of not seeing enough wildlife in a tropical rainforest tour. The fact is that our rainforest is not like the African savannas where you could see large numbers of animals. The rainforests contain great number of species, but fewer individuals of each one. Tropical rainforests are very old ecosystems that survived major changes during time. This gave enough time to the species to adapt and evolve in a very unique way. The process is called speciation. Wildlife viewing is sometimes a matter of luck, and with little amount of time in a nature vacation it is even harder, but certainly, there are some places in which the chances to come across a wild creature are higher. 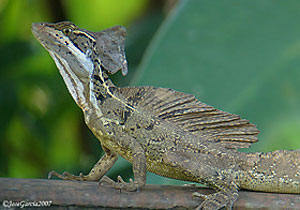 To do wildlife viewing in Panama you don’t have to travel to a far remote place. The rainforests around the Panama Canal are very good for this activity. Most of the rainforests in the Canal Corridor are moist tropical forests, and evergreen, containing wetland areas and creeks, that provide different habitats for wildlife. At the Soberania National Park the famous Pipeline Road takes you deep into the rainforest of the Panama Canal. The area contains mostly lowland tropical rainforest. 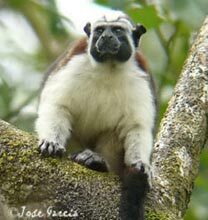 An early walk is good to do some wildlife viewing; with a little bit of luck the patient observer could see Three-toed Sloth, White-nose Coatis and Agouti; some of the local monkeys include White-faced Capuchin and Howler monkeys. Some other mammals seen regularly are Tamandua (Anteater) and Collard Peccaries. The Blue Morphos, Helicopter Damselflies and the spectacular green scenery also bring the attention of the newcomers. 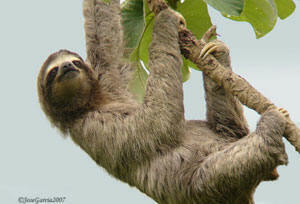 On the Caribbean side of the Canal Corridor the San Lorenzo National Park is very good to do wildlife viewing tours. An early morning walking tour on the road that goes to the San Lorenzo Castle is one of the best easy places in Panama to see wildlife. The Metropolitan Park within the city limits is a very good place to find the Rufous-naped Tamarins. This is a curious little monkey that usually comes to inspect the observer from a prudent distance on the trees, once we invade their territory. Tamarins are mainly found in South America, being the Rufous-naped the only one that goes as far as Panama. There are many other places in Panama for this activity; we only mention here the more accessible ones. A more remote nature travel to wild Darien or The Western Caribbean lowlands will provide very good results too. The Gatun Lake on the Panama Canal offers great opportunities to admire wildlife. A well-led jungle boat ride tour in the early morning will take you around the different Jungle islets of the Gatun Lake. All these islets are the hilltop remnants of a forest that once was flooded when the creation of the artificial lake for the Panama Canal. This huge body of water about the same size of Barbados Island and home of more than a hundred islands provides refuge for a great diversity of wildlife. The more common wildlife encountered are White-faced Monkeys, Mantled Howler Monkeys, Green Iguanas, Two-toad and Three-toed Sloth; birds include toucans, parrots and wetland birds, such as herons, jacanas and egrets. A lucky party can also see the American Crocodile. The best way to enjoy the forests and landscapes in Panama is certainly by walking through them. Hiking in Panama can be done in different habitats like, Tropical lowland, Cloud Forest and Mountain Forests. Hiking for long distances in the lowlands tropical forest can be very good, but the wet hot climate is a factor to consider too. Hiking at higher altitudes in which elevations offer panoramic views of green dense forests and mountain is the perfect place to do it. Treks in Panama can go from mild-moderate to very difficult ones; it all depends on how long you are willing to walk and, on the type of terrain you will be trekking along. If you are going to spend time hiking in the jungle, it is a good idea to wear the appropriate clothes; rubber boots or jungle army boots are a very good idea especially in ever-wet Caribbean forests. Columbia type t-shirts are a very good idea too. Rain gear is advisable too since in the tropics it rains more often than not. Never walk alone in the rainforest; if you don’t know the area, try to find a local guide from a nearby community since it is very easy to get lost in the jungle. There are many places and trails to hike for in Panama but few of them are well marked and you will need a professional hiking guide to attempt one trail of several days. Some of the most recommended ones are in the Panama Canal Area. Pipeline road: this road goes for 17km north and then comes back, it is mostly a gravel road at the beginning, getting much muddier after the first 15 kilometers. It goes up and down in several areas but in general no more than 50 meters above see level. In the Western Highlands Sendero Los Quetzales. Located in the Volcan Baru National Park, this is a very famous path that connects the towns of Cerro Punta and Boquete. It takes about 6 hours and it is better to do it starting from Cerro Punta going down to Boquete. This is considered one of the most beautiful trails in Panama because of its beautiful Wet highland forest, rivers, great lookouts and imposing views of valleys and mountains. Eastern Panama offers good opportunities to hike in the Nusagandi Reserve. For real hikers a very interesting journey can be done all the way to the coast (6 hours from the Nusagandi lookout) and in Carti (Coast); someone can take you to the San Blas islands. Hiking in the jungle to go to some of the Nusagandi waterfalls is a good option too. Due to the difficult access to Rancho Frio ANAM Station this trail has been few times attempted by nature travelers. You must be in good conditions to do this steep hike through the forest. A hike to Cerro Pirre from Rancho Frio will take about 10 hours to reach the top. This trail is mainly used by the Frontier National Police to go to their station at the top, so you must get authorization to go there. At the top (1200 m) you have the view of the vast Darien National Park. Four species of Macaws fly back and forth. It is advisable to sleep in the mountain and come back next day. It is a must to go with a Local Guide. To have a real Wilderness experience, there are certain elements that must be combined; of course, spectacular scenery and wild setting, contact with local communities or tribes, good local guides, traditional food, waterfalls or rivers, horseback rides, pristine rainforest, security and biodiversity. Communities have a vital stake in appropriate ecotourism development in their region, and their participation and involvement are critical to the process. Here we only mention remote safe communities to visit, living within the limits of National Parks or contiguous to National Parks. Since there are so many communities in this situation in Panama, here we only discuss few of them. A nature travel to one of these communities will require a mountain adventure spirit and at least 3 days time in your itinerary while you are visiting the country. 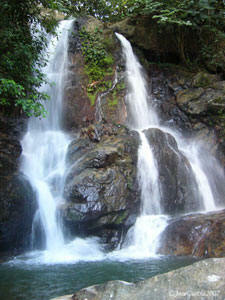 Located in the heart of the Omar Torrijos National Park (El Cope). This is a very remote hamlet reachable only via horse or walking. This is a wild set hamlet surrounded by forested mountains, lovely waterfalls and beautiful people. The remote hamlet is located 7 hours walking from the park ranger house at the entrance of the park. The recommended way to do it is walking a trail early in the morning that goes down the Caribbean slope inside the cloud forest for about 7 hours (guide needed). You need to spend at least one night there to meet the charming people and visit amazing waterfalls. The way back can be done by horse (4 hours) via a steep moody road (impassable by cars). The road goes over the valleys and offers spectacular views of the green forested valleys. Getting to the park: The park is located 180 km from Panama city; from the Centennial Bridge in Panama city you drive west on the Pan-American for 147 km until you reach The Penonome town; 18 km past Penonome there is a right turn with a little gas station; go on this good paved road for 26 km until you find the town of El Cope; keep going straight, you will find a dirt moody road that goes up 7 km to the entrance of the park. The Achiote Community located on the Western Caribbean bank of the Panama Canal is perhaps the best example of a community based ecotourism project in Panama. 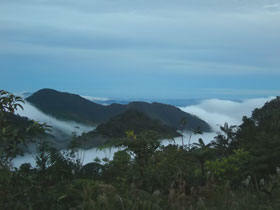 Situated contiguous to the San Lorenzo National Park. The area features achiote road for great birding, the trogon trail, local guides, restaurant and a nice refuge. A visit to a real indigenous community can be a unique cultural learning experience. There are seven indigenous tribes in Panama to choose from, each one speaks their own dialect and the majority of the tribes are located in remote places. The most accessible ones are located in the Panama Canal Rainforest along the Chagres River, like the Emberas living in the upper Chagres River. Here we discuss only the most accessible tribes. Most of the rainforests in Central America are located within indigenous territory, so if it weren't for them we wouldn’t have continuous large tracks of rainforest. Indigenous communities have special opportunities to develop ecotourism because they often live in remote natural areas. However, most indigenous people have been marginalized by their national governments. Furthermore, they may be subject to a number of pressures to change their social, technological and even religious practices. Emberas are from South America origins and several tribes live in the upper basin of the Canal Watershed. Emberas migrated from the Choco region of Colombia, and nowadays the majority of them live in the Darien Province next to Colombia. For the fortune of the ecotourist, few tribes moved to the Chagres River several decades ago searching for new similar lands and rainforests like the Darien; now they live within the Chagres National Park, and they are well organized to show their culture and welcome ecotourists. Our recommended tribe to visit is the Embera Drua. This is the last tribe in the Chagres River, hence the least visited and the most traditional one. A boat ride to get there from the dock will take from 30 to 40 minutes. The road trip from Panama City to the dock will take another 30 to 40 minutes. "We took Jose as a guide for birding excursion. He came at our hotel to take me and 2 other people and we had a very nice day. We saw that day a lot of birds; squirrel cuckoo, hummingbirds, hawks, etc. We appreciate his professionalism and his good knowledge of Panama's birds"
Home | Tours & Rates | Bird Guides | Where the Birds Are | FAQ | Ecotourism | Digiscoping | Contact Us |© 2018 Birding Panama - "All Rights Reserved"